NETWORK FINALS: After football adjustment, both KEVIN CAN WAIT and MAN WITH A PLAN dropped 0.2, and both DANCING WITH THE STARS and THE GOOD DOCTOR lost 0.1. CABLE HIGHLIGHTS: ESPN’s MONDAY NIGHT FOOTBALL jumped 0.55 from last week to 3.53. USA’s WWE telecast was at 1.08/1.08/0.96, compared to last week’s 1.12/1.07/0.99. On VH1, LOVE & HIP-HOP slipped 0.06 to 0.94, and SCARED FAMOUS was down 0.06 to 0.47. Bravo’s REAL HOUSEWIVES OF ORANGE COUNTY gained 0.02 to 0.67. On MTV, a TEEN MOM REUNION SPECIAL was down 0.06 from last week’s edition to 0.58, and a post-show special was at 0.39. On Discovery, a 2-hour FAST N LOUD was down 0.03 from last week’s hour to 0.45. On Food Network, HOLIDAY BAKING CHAMPIONSHIP lost 0.03 to 0.40, CHRISTMAS COOKIE CHALLENGE was down 0.07 to 0.29, and VEGAS CAKES was at 0.20. MSNBC’s RACHEL MADDOW SHOW topped cable news at 0.33/0.51/2.7M, over Fox News’s TUCKER CARLSON TONIGHT at 0.31/0.47/2.9M, and CNN’s SPECIAL REPORT at 0.21/030/1.1M. ID’s PEOPLE MAGAZINE INVESTIGATES rose 0.02 to 0.28, and DEADLIEST DECADE was up 0.03 to 0.22. 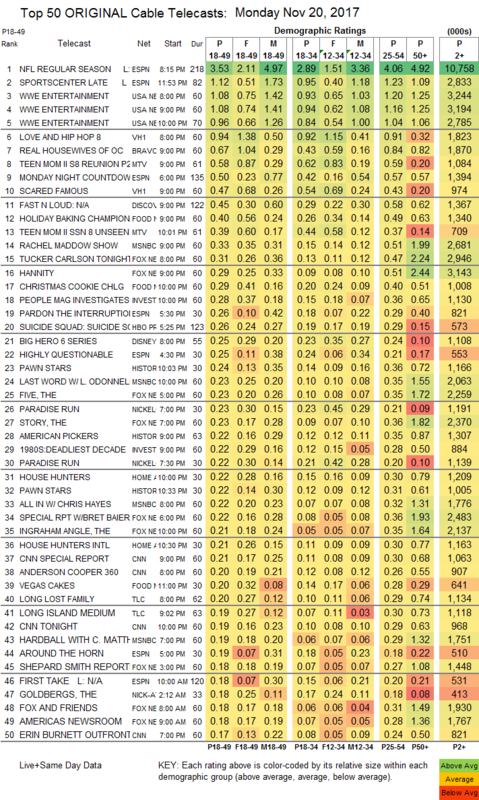 On History, PAWN STARS was at was at 0.24/0.22 compared to last week’s 0.25/0.24, and AMERICAN PICKERS ticked up to 0.22. On HGTV, HOUSE HUNTERS shed 0.02 to 0.22, and HOUSE HUNTERS INTL was down 0.03 to 0.21. 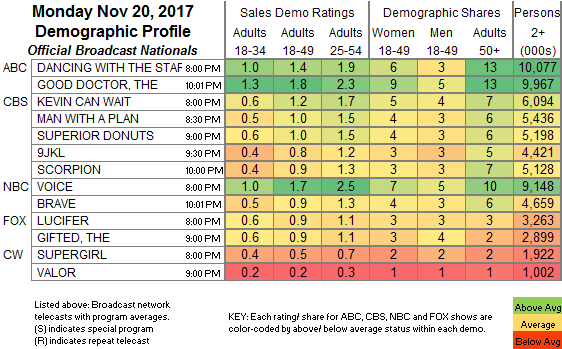 On TLC, LONG LOST FAMILY dropped 0.02 to 0.20, LONG ISLAND MEDIUM fell 0.06 to 0.19, and THE HEALER was down 0.11 to 0.12. On AMC, RIDE WITH NORMAN REEDUS ticked down to 0.15, and SECRET HISTORY OF COMIC BOOKS was down 0.03 to 0.14. A&E’s AUTOBIOGRAPHY tumbled by 0.22 to 0.12.